Looking back at the many smartphone releases of 2018, I would say that this year has been dominated by best-selling midrange handsets that gave consumers great value for their hard-earned money. Earlier this year, we saw the launch of OPPO F7, Huawei Nova 3i, Pocophone F1, Honor Play, and Vivo V9 which all performed well in the market by having great technical specifications along with an affordable price tag. Since their release, the above-mentioned smartphones have dominated the price bracket between PHP 15,000 and PHP 20,000, making that category extremely crowded. Interestingly enough, just a few days ago, Vivo Mobile released the gorgeous PHP 13,999 Vivo Y95 Android smartphone, which - for me - represents the company's plans to also also take over the sub-PHP 15,000 echelon while they have momentum. As expected, OPPO Philippines quickly answered back by launching the beautiful OPPO A7, which dons a price tag of PHP 13,990. The SRPs of these two new models put them in direct competition with the popular Samsung Galaxy J8 2018, which recently got a big PHP 2,000 price cut courtesy of the Korean Giant to make it more enticing. From selling for PHP 15,990, Pinoys can now grab it for only PHP 13,990. 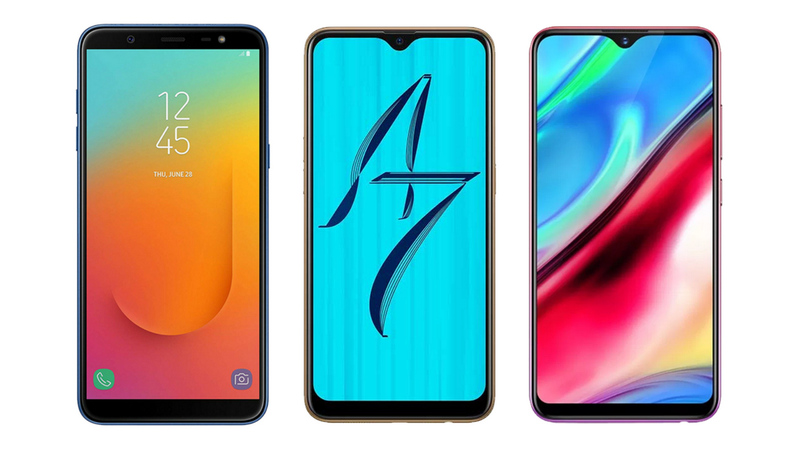 Since yesterday - when the OPPO A7 officially became available nationwide and in online gadget stores, I've been receiving many messages from my young readers asking me which among these three mid-level handsets (that all cost around PHP 14,000) they should upgrade to this Yuletide Season. If you're one of them, I made this comparative review for you. To make it easy for all of us to determine which model is the best out of three, let's check out this side by side technical specifications comparison table. Now, let's go through each feature. Dimensions: Here, I'd go for the device that's easier to hold and to keep in the pocket. And as such, based on paper, it would have to be a toss up between the OPPO A7 and the Vivo Y95. The former is ever slightly thinner while the latter has a smaller footprint. Weight: To each his own -- but for me: "The lighter, the better." Weighing just 163.5 grams, Vivo Y95 is the clear winner in this department. Display: It's a mixed bag. The Galaxy J8 2018's SuperAMOLED display has superior viewing angles and energy efficiency -- and it also doesn't have a notch, which many users are still not fond of. 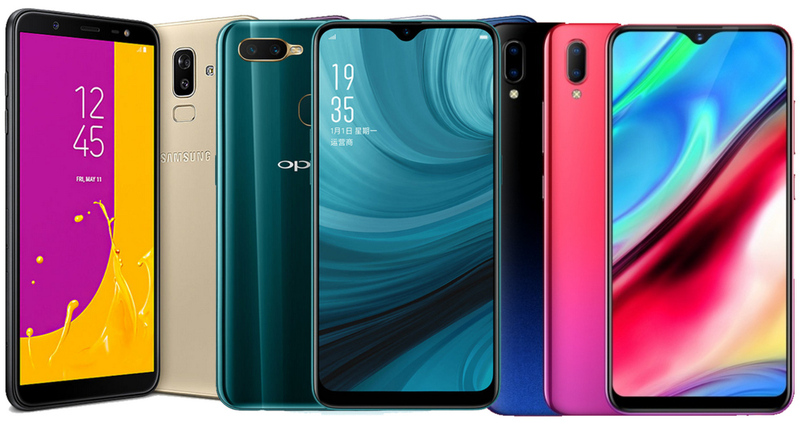 However, both OPPO A7 and Vivo Y95 feature slightly larger screens, which should result in better viewing experience when browsing social media apps, reading blogs, watching movies, or playing games. One downside that all three smartphones have is that their screens only have HD+ resolution instead of FullHD+. If you want a clearer display on a handset from these three manufactures, be prepared to spend at least PHP 2,000 more to get a 'higher' model. Front-Facing Camera: In terms of resolution alone, Vivo Y95's 20 MegaPixel selfie snapper makes it the winner here. Note: Although the Galaxy J8 2018's front cam only has 16 MegaPixels resolution, it nonetheless comes with Soft LED flash that's really useful when snapping selfies and groufies in low light settings like in bars or clubs. It's also handy when recording videos for vlogs or when going live on Facebook. Rear Camera: Again, just by looking at the resolution and the wideness of aperture for better low light performance, Samsung Galaxy J8 2018's 16MP f/1.7 + 5MP f/1.9 Back Cam Combo - I would say - makes it the superior cameraphone compared to the other two. That said, the AI imaging capabilities of the OPPO F7 and Vivo Y95 should also count for something. I can't wait to do a camera shoot-out between these two models. Stay tuned! User Experience: This one's subjective. Personally, I think many Pinoys would find Samsung Experience to be a bit more familiar since the Korean has been in our market the longest. Based on my experience, I think ColorOS and FunTouch OS are both reminiscent of Apple iOS with OPPO's interface - especially the Settings section - appearing just a bit more organized. Processor and GPU: Overall, Qualcomm Snapdragon 450 with Adreno 506 is slightly more powerful than Snapdragon 439 with Adreno 505. Hence, the winners here are Samsung Galaxy J8 2018 and OPPO A7 albeit not by much. RAM, ROM, microSD Card Slot: It's a tie between all three. Security Features: All three models have a Fingerprint Scanner at the back and Facial Recognition Software integrated into the front-facing camera. Price: Vivo Y95 is more expensive than the other two by just PHP 9. Come on. It's a virtual tie. Design: Again, this one's subjective. After all, we all have our individual tastes when it comes to smartphone aesthetics. Personally, I find the OPPO A7 and Vivo Y95 with their all-screen faces, glossy back panels, and textured or gradient look more attractive than Samsung Galaxy J8 2018. But hey, that's just me. To wrap up, I'd say that all three models have their own strengths and merits. If you want your new smartphone to have a high resolution selfie cam with AI Beauty Technology, very large display, eye-catching gradient design, decent internal hardware, and long battery life, go for Vivo Y95. If you want superior internal hardware for better gaming experience, unique yet luxurious design, big battery pack, AI-powered cameras, and sizable screen on your handset, choose OPPO A7. But if you want a notch-free cameraphone that does well in low light conditions all while having more than capable internal hardware for a variety of mobile tasks, there's always the Samsung Galaxy J8 2018. Whatever model you choose, I don't think you can go wrong. It's all just a matter of which key features of each device matter to you more as a consumers. Cheers!